Stovetop popcorn: Why it’s infinitely better than microwave. When I was a kid, there were two kinds of popcorn, as far as I knew: movie theater and microwave. (The only exception was the output from my grandma’s electric air-popper, which saved me the trouble of finding out what packing peanuts tasted like.) Most of my grown-up friends still seem to hold this benighted worldview. In fact, serving popcorn made on the stove, rather than in the microwave, is the most reliable way I’ve found to impress guests without doing anything actually impressive. Look, I get why people eat microwave popcorn. It’s good in the same way Doritos are good: Doused in artificial flavoring, it’s addictive and crazy salty, and it leaves your hands covered in weird powdery stuff. As with most commercial snack foods, its flavor seems designed to be both intense and fleeting, so that you can’t stop yourself from reaching for the next handful, even though the payoff diminishes with each bite. Stovetop popcorn, on the other hand, tastes good in the way that real food tastes good. The key is the oil, which lends a satisfying savoriness that actually gets better with each mouthful, making the last few bites feel pretty decadent. 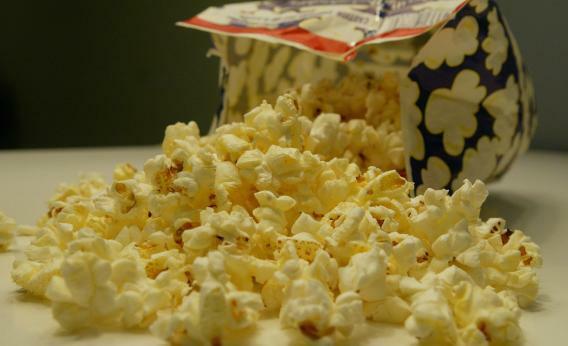 (Have you ever wondered why movie popcorn is even more orgiastically addictive than the microwave kind? It’s popped in amounts of oil that would make Mike Bloomberg weep.) Any oil should work, but extra virgin olive oil will yield by far the most delicious results. And stovetop popcorn is incredibly easy to make. There are literally three steps: turn on stove, add oil, add popcorn. (Are you writing this down?) The Internet abounds with neurotic tips and warnings about how easy it is for your kernels to burn, but as long as you don’t add more than a single layer of kernels to your saucepan, don’t set the heat too high, and leave the lid slightly ajar, you will have a very hard time making a bad batch. You can melt some butter to pour on at the end, but frankly, I think you’ll find you don’t need it. Apart from taste, there are some empirical benefits to eschewing microwave popcorn. First, there’s cost: a box of Pop Secret costs $3.59 at my local grocery store. At three bags of popcorn per box, that’s about $1.20 per 100-gram bag. A 900-gram bag of plain yellow popcorn kernels, on the other hand, goes for $2.59, or about 29 cents per 100 grams. So you’re paying four times as much for the dubious convenience of getting to heat your corn kernels using microwaves rather than fire.